UMKC School of Medicine members of the Gold Humanism Honor Society delivered roses and hand-made cards to patients as part of Solidarity Day on Feb. 15, the day after Valentine’s Day. A rosy air wafted through Truman Medical Center Hospital Hill on Monday afternoon. 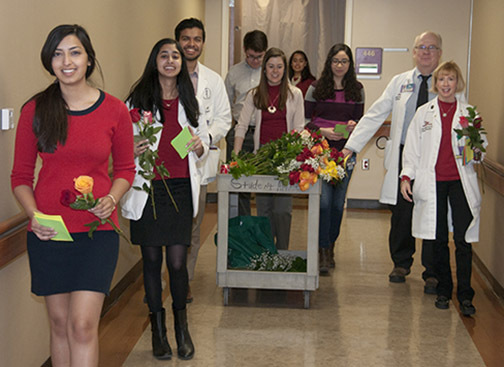 Each year since 2011, right around Valentine’s Day, members of the School of Medicine chapter of the Gold Humanism Honor Society hand out roses and cards to patients as part of National Solidarity Day for Compassionate Care. The day is part of the national society’s Solidarity Week that encourages medical schools and patient care facilities to focus on the importance of kindness to patients. Seven UMKC students selected recently to the Gold Humanism Honor Society participated. They joined faculty sponsor Carol Stanford, M.D., docent and associate professor of medicine, and her husband, Jim Stanford, M.D., also a docent and associate professor of medicine, in delivering flowers and cards. Carol Stanford said students in the society conducted fundraisers throughout the year. Part of those funds were used to purchase the 23 dozen roses that were presented to patients throughout the hospital. “Last year, we had enough roses to give one to every patient and handed them out in the clinics, as well,” Carol Stanford said. Gold Humanism students also spent time hand-crafting stacks of cards filled with uplifting thoughts and well wishes to hand out with the more than 270 roses.